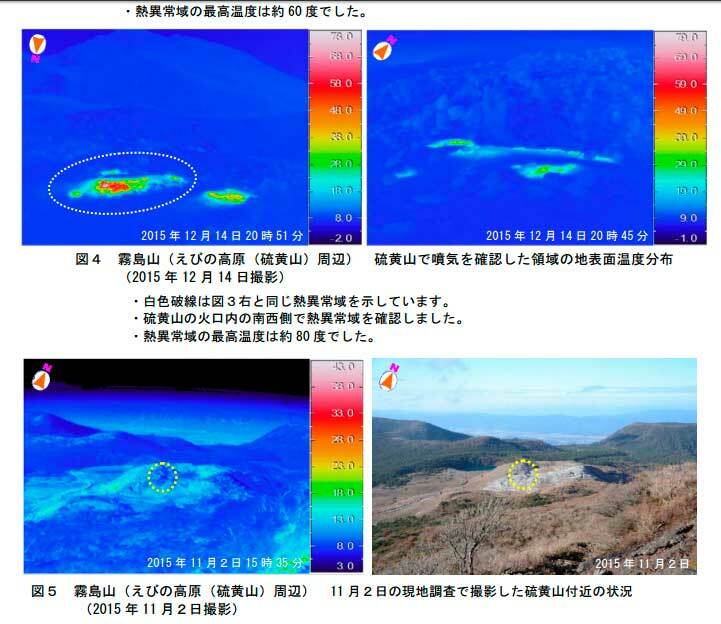 Kirishima (Kyushu): New fumaroles have been detected on the SW flank of the Iozan Ebino crater and a strong sulfur smell was reported. No other signs of significant unrest have been detected at the volcano. Sinabung (Sumatra, Indonesia): (16 Dec) The volcano continues to slowly extrude viscous lava that builds up the active dome with several overspilling lava lobes. As parts of these break off now and then, small to moderately large pyroclastic flows are being generated from time to time. Rinjani (Lombok): It seems that the eruption at the Barujari cone is over. After a period of intermittent, sometimes quite strong vulcanian-type explosions at the end of Nov and early Dec, no explosive activity has occurred since 3 December and no thermal signal is being recorded on satellite data. It seems that the emissions are generated by mild explosive activity still relatively deep inside the crater. So far, no images of incandescent ejecta on or outside the crater have appeared, but this might occur soon if activity increases. According to VSI, volcanic tremor has been elevated with a tendency to increase during the past days. Colima (Western Mexico): (16 Dec) Activity at the volcano remains elevated. Moderate to strong vulcanian explosions occur every few hours. Attached is a fantastic image showing volcanic lightning during such an explosion on 14 Dec, taken by Sergio Tapiro. Fuego (Guatemala): Another phase of strong increased activity (paroxysm) has started at the volcano yesterday. The volcano observatory reports that explosions have become more intense and frequent, 4-6 per hour, on the evening of 14 Dec.
Ash plumes rose up to 1 km and loud shock waves accompanied many of them. Two new lava flows, 800 m long, have started to head towards the Santa Teresa (west flank) and Trinidad (south flank) drainages. This would be the 13th paroxysmal episode during 2015, and if activity increases further, dangerous pyroclastic flows are likely to occur in the coming hours / days. In particular, river beds and valleys at the feet of the mountain should be avoided at all times, as these are high-risk areas.